Keeping everyone safe on the playground is important and the proper installation depth of certified playground mulch is the first step. Playgrounds should be resurfaced annually, at a minimum, to maintain a safe level of playground mulch, especially in the fall zones and low areas. 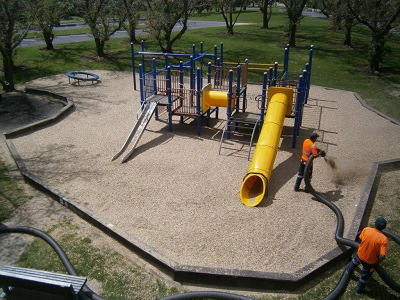 Playground mulch is certified through the IPEMA (International Playground Equipment Manufacturers Association) and they test for impact force when fallen on as well as ensure that it is free from sharp object such as metal and nails as well as hazardous materials such as arsenic, lead and mercury. One other thing that is tested is the products ability to knit together for added safety. Weather it is ten cubic yards or 1000 cubic yards Pittsburgh Mulching Innovations can install your playground mulch to the proper depth quickly and efficiently with very little mess and disturbance with our fleet of blower trucks. Pitttsburgh Mulching Innovations. All rights reserved.